Not always a higher price means better quality compared to other products of other origins, such as Chinese. Alfawise AR182BLDC proves it, because we will have a 2 in 1 quality vacuum cleaner for less than we expect. 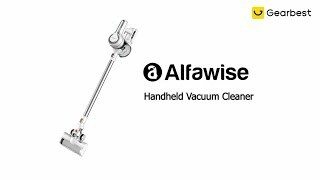 The Alfawise AR182BLDC is a vacuum cleaner that can be used either as a broom or as a handheld vacuum cleaner and stands out for its rounded edge design and white colours so typical of Alfawise. It also has dimensions of 33.00 x 11.50 x 22.50 cm, but the best thing is its weight, since with just 1.4 kg it is a very manageable device and comfortable to use. As we say, its minimalist design, representative of the brand that made it, is what most captures attention. Moreover, being compact and elegant, we can appreciate that practicality is not at odds, far from it, with design. Therefore, you will save many efforts when using it, because you will not weigh as much as others and with different heads you can use it on many types of surfaces, both at home and in your car. Corners, door frames, furniture… nothing will resist your new weapon against dirt. You’ll find that thanks to its ergonomic and comfortable handle for holding and carrying it, cleaning will be easier than ever. In addition, its head can rotate up to 270º, so its movements are very fluid and it can move very well on surfaces (something to be thankful for when we are talking about this type of vacuum cleaner for its characteristics). All this is possible because the Alfawise AR182BLDC works, as you may have already imagined, wirelessly, which means that you can go anywhere and not have to worry about the always problematic entanglements with cables or the limits that devices with them suppose. 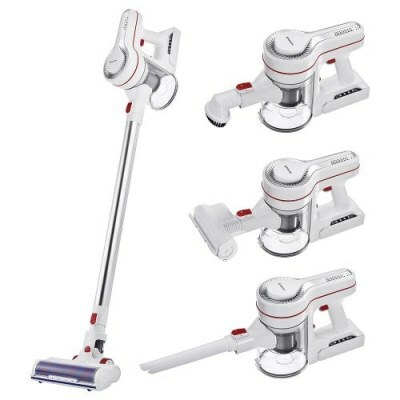 To do this, this vacuum enjoys a rechargeable 2200 mAh lithium ion battery built and with a great resistance that ensures a longer life and, in turn, much more practical for the savings that this will mean. As for its cleaning modes, it offers two. On the one hand, a speed, as we have said standard, which works for most occasions and works very well on hard floors, and on the other hand, a turbo speed that is ideal when cleaning other types of surfaces prone to dirt gets embedded in them, such as carpets. Both work very effectively thanks to the advanced multi-stage cyclonic system of the Alfawise AR182BLDC that separates dirt from the air with great efficiency. Two optional modes. At the same time, its filtering system composed of a fine stainless steel mesh also adds an additional degree of efficiency to daily use and with its reusable cotton filter we will achieve a much cleaner environment not only on the surfaces, but also in the air, as there is not so much remission of dust and this benefits the health of everyone at home. The Alfawise AR182BLDC therefore helps you to combat household allergens such as dirt, dust and mites so that you can live in a much cleaner and healthier environment. Finally, the dust deposit of the Alfawise AR182BLDC has a good capacity, which is the same, it can contain up to 300 ml of dust and dirt so it is very useful when treating very large areas, for example, or perform with this vacuum cleaner a daily cleaning. Make use of its different heads to treat the different areas of your home, such as the floor, upholstered furniture, beds, corners, skirting boards or even the keyboard of your computers and get the most out of it. Like other products manufactured by Gearbest, the Alfawise AR182BLDC responds to a very good value for money, as its price does not exceed 200 euros and brings good performance. Its strong points lie in its design, light weight and easy to handle, in addition to the different heads that allow you to use it not only on floors, but also in furniture. However, if we had to remove any defect from this vacuum cleaner is that it does not guarantee that it will work well with pet hair, so it is likely to become tangled in the brush.